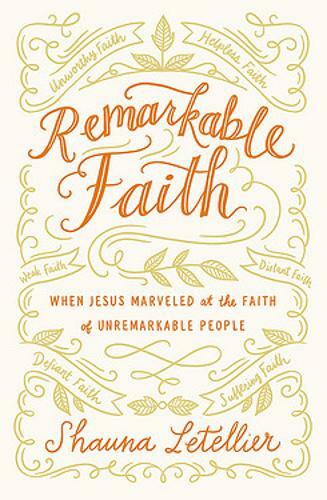 REMARKABLE FAITH tells the stories of people whose faith was of such quality that Jesus himself marveled at it-people who were broken, needy, and dependent. These ten inspiring vignettes weave history, theology, and fictional detail into their biblical accounts to bring relief and a new perspective to those whose faith feels unremarkable. Written to encourage and relieve discouraged Christians who wonder if their faith is a disappointment to God, this book will demonstrate that remarkable faith-the kind Jesus marveled about-isn't about achieving or performing. Readers will discover they can exchange their performance-based evaluation of their faith with a fresh, life-giving intimacy with the Jesus who delights in transforming inadequacies into irrepressible affection. "Her words chosen with exquisite grace, Shauna Letellier does something remarkable--she draws us near to the broken hearts that drew Jesus. Then she does something even more remarkable. She draws us near to the brokenness in our own hearts. The most remarkable thing she does, though, is to draw us near to Jesus, showing how eager he is to bring healing and wholeness--not just to their hearts but to ours."